Realogics Sotheby's has given the name “Gold Coast” to the Lake Washington shoreline stretching from Faben Point at the northwestern tip of Mercer Island to Beaux Art Village, and from there to Saint Edward State Park north of Kirkland’s Juanita neighborhood. The across-the-water city views of Bellevue and North Seattle from these locations, together with the quality of life in these world-renown lakefront communities, make Gold Coast homes among the most sought-after in the region. RSIR brokers bring extensive knowledge of this area to buyers and sellers of the best homes that the Puget Sound has to offer. "There’s a general trend for waterfront home values to multiply the closer they are to the central Eastside waterfront of Lake Washington – the Gold Coast of the Pacific Northwest. Prices range from the low $200s per sq. ft. in exurban Kitsap County to grand estates in Medina where recent trades appear to be approaching $3,000 per sq. ft. 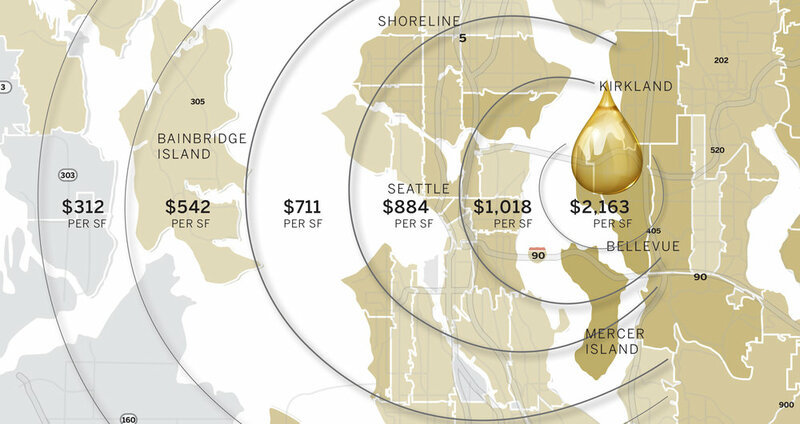 Consider the relative value comparisons: a typical waterfront home on Bainbridge Island will average $500 per sq. ft. while a similar home on West of Bellevue or Mercer Island would command roughly twice the price." - William Hillis, Research Editor with RSIR. While living anywhere along Lake Washington would be a prized lifestyle, the most coveted shoreline remains the waterfront communities of West Bellevue, Medina, Hunts Point, Kirkland, Juanita, Beau Arts, Enatai, Newport Shores and the north end of Mercer Island. These sought after neighborhoods offer close proximity to job centers, access to preferred public and private schools and comprise the most valuable residential real estate in the Pacific Northwest.